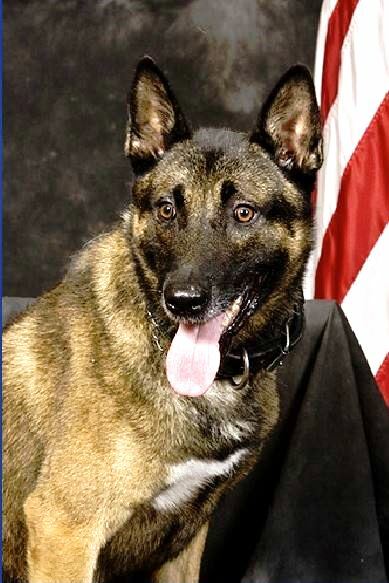 The Morristown Police Department would like to announce the retirement of police K-9, Mako. Mako was recognized for his retirement on Tuesday, May 17, 2016 at the City Council Meeting. K-9 Mako has been with the department since 2008. His partner has been Detective Pete Shockley throughout his career. Like other MPD K-9’s, Mako was trained for narcotic odor detection, off and on leash obedience, area searches, building searches, tracking, officer protection and criminal apprehension. K-9 Mako has had a successful career and has been used in various community events; he is retiring due to his age and the promotion of Detective Shockley last year. They have remained part of the K-9 Unit until Officer McCarter and his K-9 partner, Riot were certified. He will retire to a good home and be able to stay with his partner, Detective Shockley. He will receive lots of attention and love.